To build a strong safety culture you need employees to be more than just rule compliant. 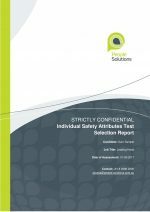 This test, developed by psychologists and safety experts working in safety-critical roles, reveals if individuals are likely to behave in ways that foster a safe working environment. Please fill in your details below for more information on this test.